A great pub for whisky – I forked out £7.40 for an Ardmore fifteen year vintage – which given I know as much about whisky as pole dancing – was perhaps a bit silly. It tasted good though, as did the beers n another visit – dark Munro mild was especially impressive. Another unassuming pub from the outside which reveals a gorgeous interior. Again, its the ceiling and the island bar that make this special. Old favourite of mine while visiting Edinburgh. 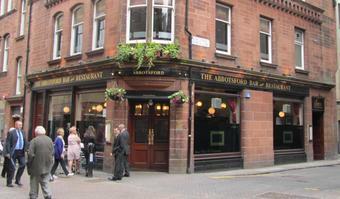 This place used to be a regular Friday lunchtime pint or two for me in the late 80's. It has not changed much apart the nicotine stains it had back then. Beers are still good and fairly handy for the station. Still popular with office workers, tourists and Rose Street pub crawls. Food can be expensive but it looks and tastes very good. You get what you pay for. Only criticism is that the service can be pretty hit or miss depending on who serves you. The first stop on our first visit to Edinburgh. An amazing interior and an interesting choice of ales, served by the traditional Scottish water-engines. A great introduction to a great drinkers' city. Just time for one more pub on my first day in Edinburgh. 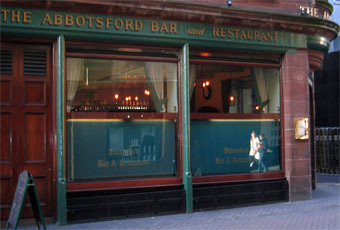 The Abbotsford is at the eastern end of Rose Street. I understand the western end is much busier. It was very quiet in here. Although it was late on a Sunday evening. Has a lovely interior and as I remember, service was fine. Ales were Windswept Wolf & Aurora, Strathaven Old Mortality, Orkney Pale Ale & Oakham Citra.